Arsene Wenger is said to be an admirer of the Argentina international and tried to sign him two seasons ago when he was a Real Madrid player, but Napoli president Aurelio De Laurentiis says that if the Gunners want the 27-year-old they must pay his £66m buyout clause. 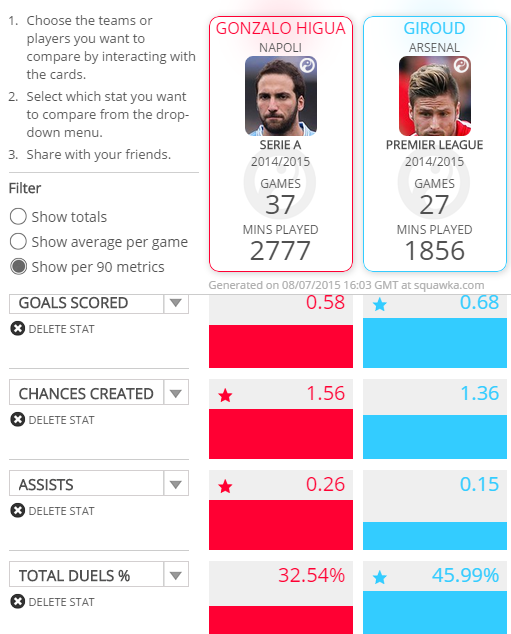 The problem I have with Higuain is that I don’t think that he is a big improvement over Oliver Giroud, and the stats seems to show that they are actually pretty similar. For that kind of money you would expect to sign a world class striker at the top of his game, but I don’t see Higuain in that category. He has a nasty habit of missing goals at crucial points in a game. The Copa America final is a prime example of that where he missed gilt-edged chance to score the winner in the 92nd minute with goalkeeper Claudio Bravo already beaten. He then followed that up by blasting his penalty in the shootout into row Z. Higuaín’s previous horror moments include the one on one he failed to convert against Manuel Neuer in the World Cup final, hitting the post with an open goal against Lyon in the 2009-10 Champions League, and his penalty miss against Lazio that cost Napoli a place in next year’s Champions League. What do you think of Higuain? Is he worth that kind of money?